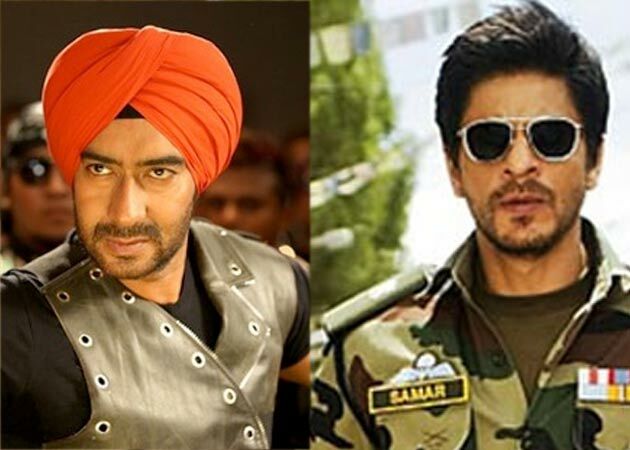 Ajay Devgn is all set to Play Damdaar Role In Chennai Express.He has always enjoyed exceptional support from Salman Khan in the industry and it was quite evident with the recent tussle at the box office between SRK’s JAB TAK HAI JAAN and Ajay’s SON OF SARDAAR. However, SRK was supportive of the stand taken by Ajay which Ajay graciously acknowledged. But will the budding understanding between SRK and Ajay change the course of Ajay-Salman friendship.? Where is Shah Rukh? We are waiting for him," wailed 16-year-old Azhar Zakaria, one of the hundreds of locals who crowded the barricades during the opening ceremony of the Marrakech Film Festival in Morocco, which was packed with Bollywood stars. But alas, Shah Rukh Khan, the star many had come to see, was expected to arrive only on Saturday, while the opening ceremony was held on Friday. But the superstar's absence did not entirely dim the enthusiasm of the gathered crowd, many of whom were waving Indian flags and shouting SRK's name. There were enough and more stars and directors from the Hindi film industry to keep them happy, including Amitabh Bachchan, Hrithik Roshan accompanied by his wife, Sussanne, Rishi Kapoor and Neetu Singh, Arjun Rampal, and filmmakers R Balki, Gauri Shinde and Karan Johar. "This is my first time in Marrakech," said Karan, who is there together with the cast of his film Student Of The Year. "But I was suprised to see that most people recognised me and knew my name. They've been coming to me and praising my film." JTHJ collected 0.8cr In Friday,Managed 118cr In Indian Box-Office Till 30th Nov.
After enjoying an extended weekend Diwali release, Jab Tak Hai Jaan however did not show any drop From its 2nd weekend at the domestic box office. The movie made 2.75 Crores on its 2nd Friday, 3.65 Crores on Saturday and 4.65 Crores on Sunday. With making a business of about 11.05 Crores in its 2nd weekend. After 2nd Weekend(26th/Nov to 30th/Nov)It Collected 9.05cr. JTHJ now stands at a domestic total of 118Crores.It is Expected That It's Lifetime Collection Will Be Around 120-125cr In India. The movie which has entered the 100 Crore Club & beaten Housefull 2 Lifetime Collection (114cr) at India Box Office. Note-: It Should Add 2cr More to its Collection to Be a Blockbuster In India. Shah Rukh Khan Is Undisputed In Oversease Circuit Since 2000.His Movies Like Kuchh Kuchh Hota Hai,Kabhi Khusi Kabhi Ghum,Kavi Alvida na Kehna,My Name Is Khan,Don 2 Has Done Exceptional Business in Oversease Market. 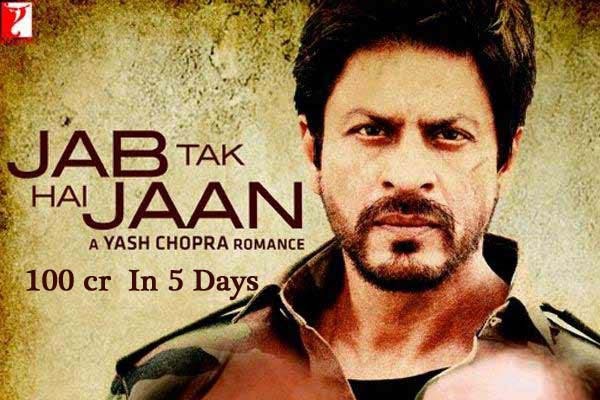 His Recent Release Jab Tak Hai Jaan Seems To Add Extra Feather to His Cap. Kiaara Sandhu Who Is a Film Critic & Jounalist in UK Bollywood Magazine,Helped Us Prepairing Jab Tak Hai Jaan's Successful Journey In Oversease Market. In Pakistan,Jab Tak Hai Jaan Released on 16th Nov. in 35 Screens & Collected Huge 93Lakhs in Two Days due to Strong Pre-Release Buzz ,Which is A record by any bollywood Movie.Opening Day Collection In Newzeland and Singapore is 30 Lacs & 1cr. Respectively With Minimum no. of Sceens. The Same Happend When It Was Released In Germany,Broke all Opening Records of a Bollywood Movie Which Was Previously Held By DON 2 & Kavi Alvida na Kehna in Germany.Germany is Known to have Shah Rukh's 2nd Most Fan Following Center At Oversease Market After Pakistan. It Was Noted That In UK and USA due to High Demand,Son of Sardar shows are Replaced with Jab Tak Hai Jaan. Total Collection at Oversease Market Till Sunday(Day-6) Is Recorded 44.56cr For JTHJ.There Is No chance Of Drop in Overseas,Film will sustain Till Next Week & Expected To Collect Around 80-90cr In It's Lifetime Run. Jab Tak Hai Jaan on Sunday has registered huge jump at the box office in places like Northern India. In centers like Delhi, Gurgaon occupancy is around 75-80%+. Advance booking for Evening and Night shows are also huge. Bad news is Mumbai and Maharashtra Belt is closed. JTHJ is going to lose at least minimum of 4-5 crore from this belt itself on Sunday itself. Still rest of India performance is excellent. Business in multiplexes and high-end multiplexes is outstanding. Single screens have also picked up after average Friday and Saturday. Still early days, but around 13-14 crore nett is expected from JTHJ for Sunday, as per early trends. JTHJ already collected around 71 crore nett in first 5 days. Its 6 days extended weekend is heading for around 84-85 crore nett mark. Had Mumbai and Maharastra belt theaters have been opened for Saturday evening and Sunday night shows, extended weekend collection would have been easily around 90 crore nett mark. Diwali Release Jab Tak Hai Jaan Continues Its Successful Journey at Box Office.Now More Enjoyment For Shah Rukh Khan Fans,As Jab Tak Hai Jaan(JTHJ) Collected 102.3crs Worldwide In Just 5 days beating Ek Tha Tiger's Worldwide Record of 98.8cr(5 Days Collection). Making some great collections at the domestic box office, JTHJ has also scored large at the overseas box office. The movie grossed over 32cr. at the overseas box office in just 5 days In 600 Screens. This proves that Shah Rukh Khan is still a winner at the overseas box office. The King of Romance has 15 overseas hits (between 2000 and 2011) to his cap and Jab Tak Hai Jaan is sure to add another feather to it. The Yash Chopra directed film has made about 71 Crores in its 5 days run at the domestic box office. It is only a matter of time before the Bollywood Biggie emerges to be a hit. The movie managed to hold up pretty well in most part of the countries, except Maharashtra where the sad demise of politician Balasaheb Thackerey closed down theaters. All the theaters were shut in Maharashtra towards late evenings .The state’s theaters will also be shut on Sunday which means the Jab Tak Hai Jaan will incur considerable losses About 5-6Cr On Sunday. Amitabh Bachchan, who returned home later after attending the premiere of late Yash Chopra's "Jab Tak Hai Jaan" (JTHJ), feels it is one of Shah Rukh Khan's finest performances. Chopra passed away on October 21, just days before the release of his swan song, starring SRK, Katrina Kaif and Anushka Sharma. His family decided to go ahead with a gala premiere to as a tribute to Chopra with the who's who of Bollywood attending. Ironically, Chopra was last photographed on Bachchan's 70th birthday on October 11. In an early morning post, the actor wrote, "Just back from YRF and the premier of the film 'Jab Tak Hai Jaan', followed by a party ... And the film... What can one do, or say about it ... Each portion poetry, each artist at his and her best, and for Shah Rukh his best performance after 'Swades'." Bachchan was impressed with the old world charm of the studio. "... And the film and stand alone ambience heatre built of such period architecture, reflecting the carving original of the columns, and the entire ambience in the style of some old castle in early Europe. It was magical... Just the way Yash ji would have wanted."